$1,000 for non-members, $950 for members. Non-refundable deposit of $300 must be made by May 24 to reserve your place. 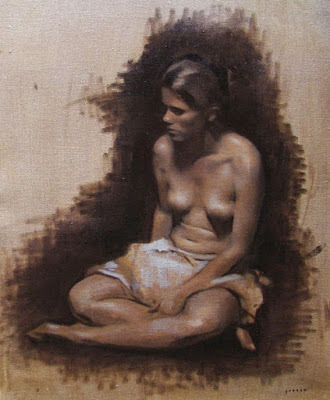 During this 5 day class students will work on one pose as we explore the various stages of the figure painting process. Through daily demonstrations and individualized critiques we’ll discuss basic and advanced concepts of understanding and deconstructing the visual experience into easily understood elements, ultimately developing a structured thought process for translating those elements accurately in paint. Using a limited palette, we’ll explore figure construction, the relationship of light and form, tonal abstraction, palette organization and the “optical impression”. .
Jordan Sokol is the Director of the U.S. branch of the Florence Academy of Art. Please call the Lyme Art Association at (860) 434-7802 to register. A non-refundable deposit to hold your place in this workshop is $300. The balance, $700 for non-members or $650 for members, is due before midnight on May 24, 2019. If the balance (or full payment) is not received by May 24, your space may be forfeited without notification. If you register on or after May 24, please pay the full amount for the class. A $300 payment after May 24 does not reserve for you a place in the class. Once the class is full, you may put your name on a waiting list.